Hope you all had a lovely weekend. I held my bi-monthly crafting get together on Saturday which was lots of fun and really productive for me. I had been feeling a bit overwhelmed with things beforehand and so the day was really needed for my own sanity! We really do have such a giggle and it always warms my hear to be around such lovely friends and enjoy the day crafting, chatting and eating mostly cake! If you would like to come along, I will be announcing the date of the next get together soon. Alternatively, we get together on the 1st and 3rd Tuesday of every month between 6.30pm - 9pm. 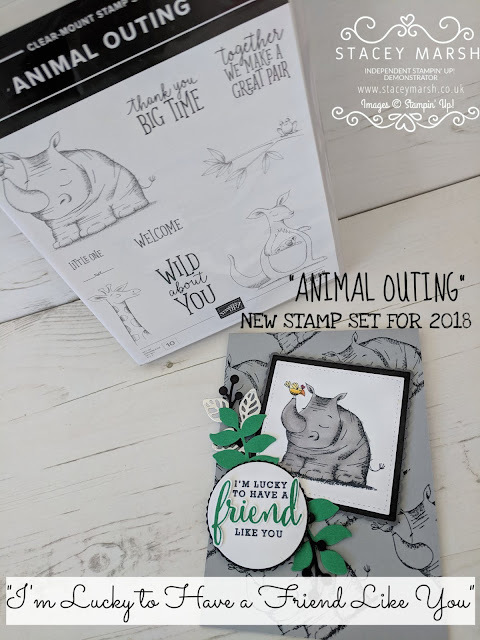 The card that I am sharing with you today was one that I put together on Saturday, using the **NEW** Animal Outing Stamp Set. 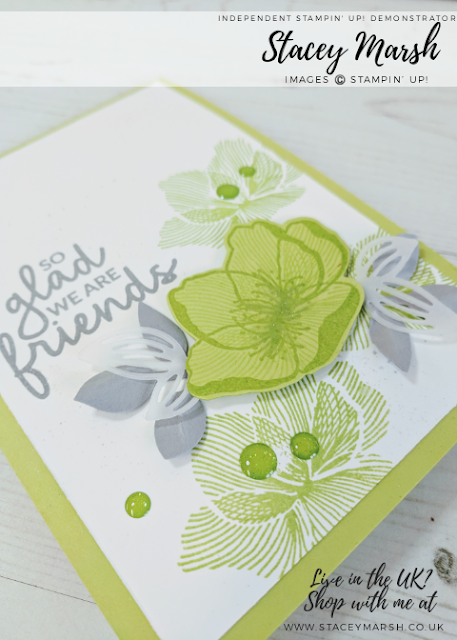 This is a Photpolymer stamp set that is hand-sketched animals and sentiments. As demonstrators we were given this stamp set for FREE when we attended the recent national catalogue launch and I really think it is going to be popular for making new baby cards as the animals are really quite cute! They're also great if you love a bit of colouring with Watercolour Pencils, Alcohol Markers or good just good old ink! 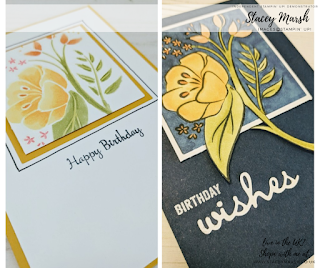 In good Stampin' Up! fashion, there are also matching dies that are available to buy! 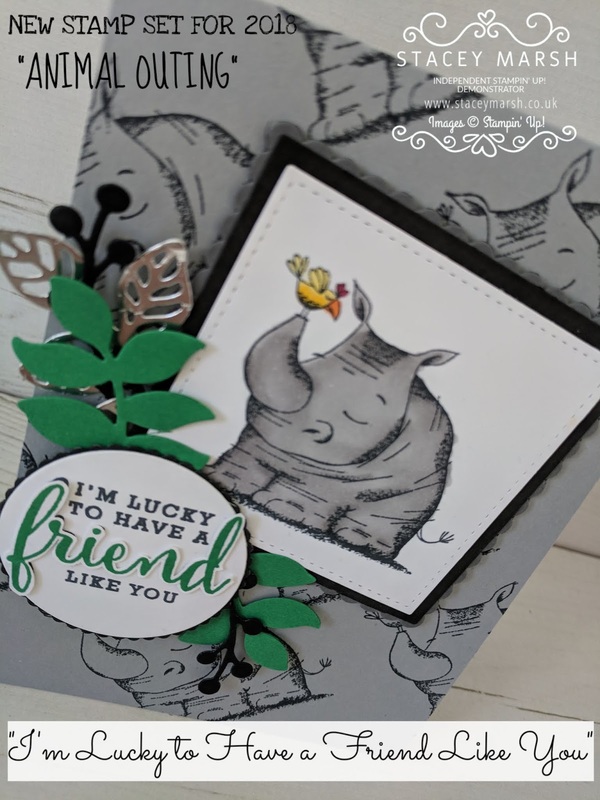 I have started by stamping the elephant image across the card base. I have used Basic Gray here (it is retired, however I haven't yet received my new colour ink pads). I find gray is less harsh than black. 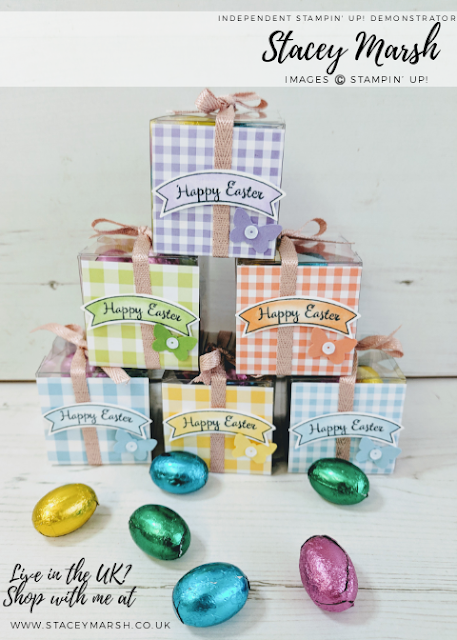 The selection of squares have been die cut using the Layering Squares Framelits and Stitched Shapes Framelits. 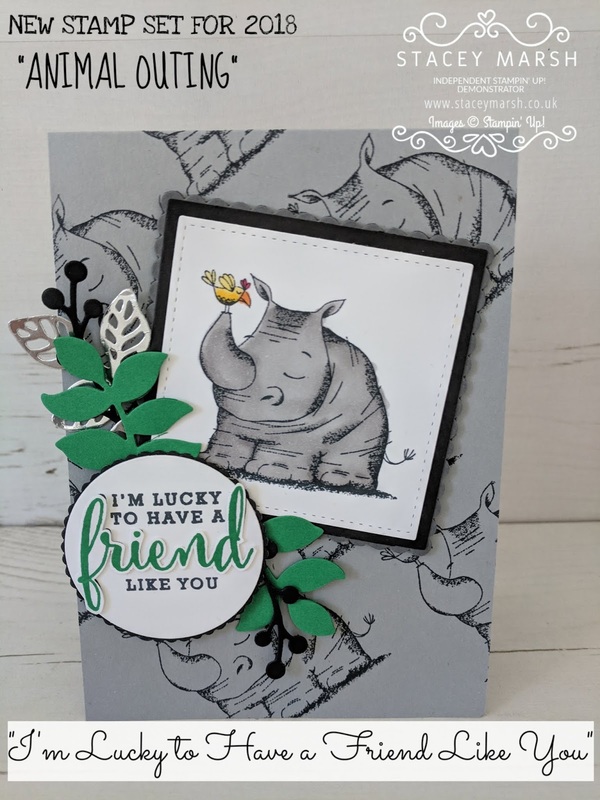 For the main elephant I have stamped using a Tuxedo Black Memento Ink and coloured using a selection of Stampin' Blends alcohol markers. 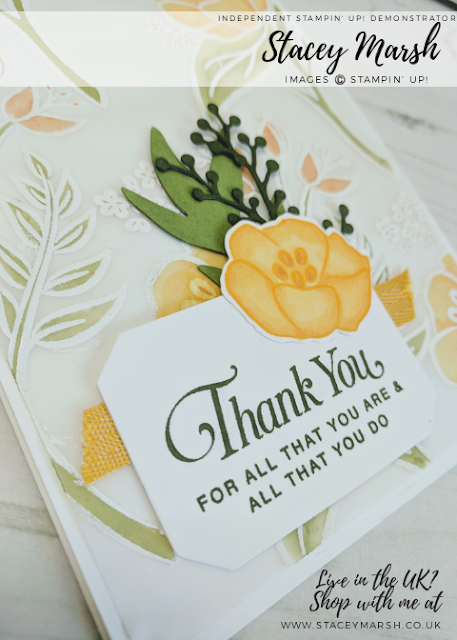 For the sentiment, this comes from the **NEW**Love What You Do Stamp Set and I have stamped this in black ink and separately in Call Me Clover, cutting around the word "Friend" and attaching over the black friend. 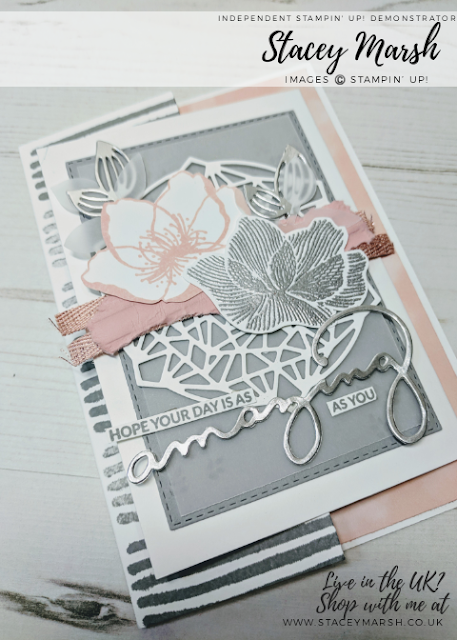 This has the been die cut out using a small plain circle die from the Layering Circles Framelits. I have then cut a scalloped circlet from the same set in Basic Black cardstock. 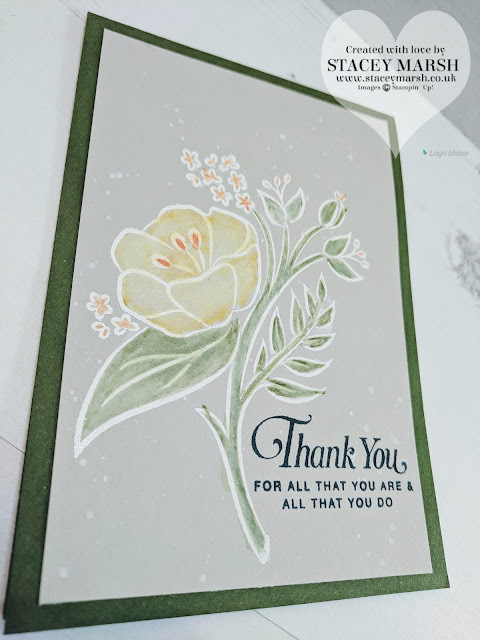 To Finish, I have cut a selection of leaves from the Eclectic Layers Thinlit Dies and the Flourish Thinlits Dies in Call me Clover Cardstock, Basic Black Cardstock and Silver Foil Sheets. Thanks for reading today! If this product is on your wish list, click shop now to order!